So, I am currently obsessed with the above platform wedge boots. It has come to my attention recently that I don't even own a single pair of wedges, which is both disappointing and surprisingly embarrassing as I thought I had all shoe frontiers covered. Not so, evidently. So these are on my must-buy list. 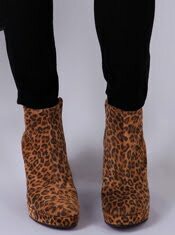 I love everything about them...the shape, the print, the 'Isabel Marant-ness' of them. Swoon. But there had to be [of course,] a rub. And it comes in the form of the price tag: £230! OWIEEEEEE! They are from my-wardrobe.com and are by Mentor. And I am considering them as a serious investment! What do you all think? Do you ever buy really expensive pieces? Because you love them? !